Cover for "The Kundalini Poems"
Cover for "The Kundalini Poems: Reflections of Radiance and Joy"
Here is the cover for my new book, which will be up on Amazon and B&W as well as the wonderful publisher, Emergence Education Press, in a few days. I will let you know when it is available to purchase. What you seek was seeking you. who still haunt my dreams? in the midst of sorrow? 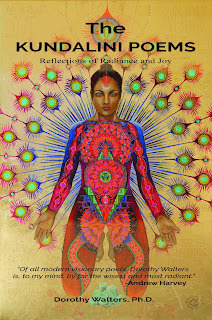 Poetry reading Tuesday, November 27, 6:00-7:00 p.m.
Dorothy will read poems from her just published book "The Kundalini Poems." Dianna will read poems and also excerpts from her novel in progress. held me in Her arms. until it became who I was. or of others as they passed by. 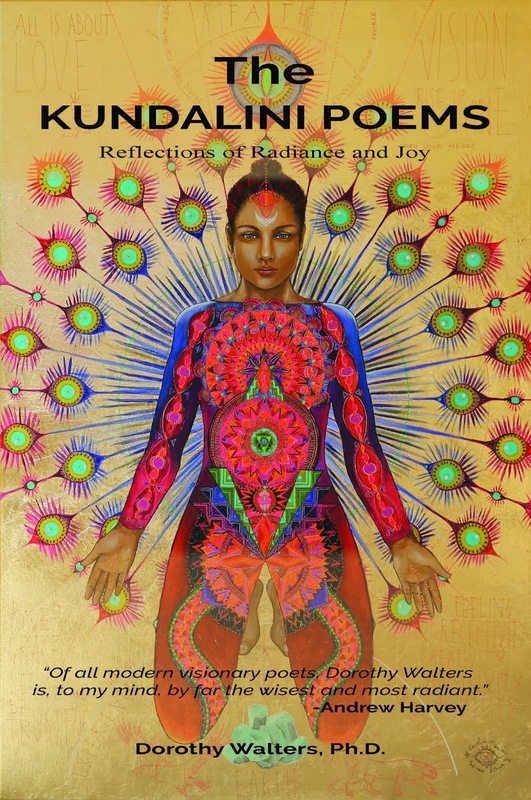 Of the many presentations on Kundalini I have found, this is one of the best. I did not realize until the end that I knew this speaker, or at least had met him some time back. The only reservation I have is that when he describe his visual symptoms (wavy lines and such), he implies that everyone will have them (not true). Also, he gives scant attention to bliss, which I feel is the most important aspect of all, for this is the state that tells us that we are indeed connected to the divine. 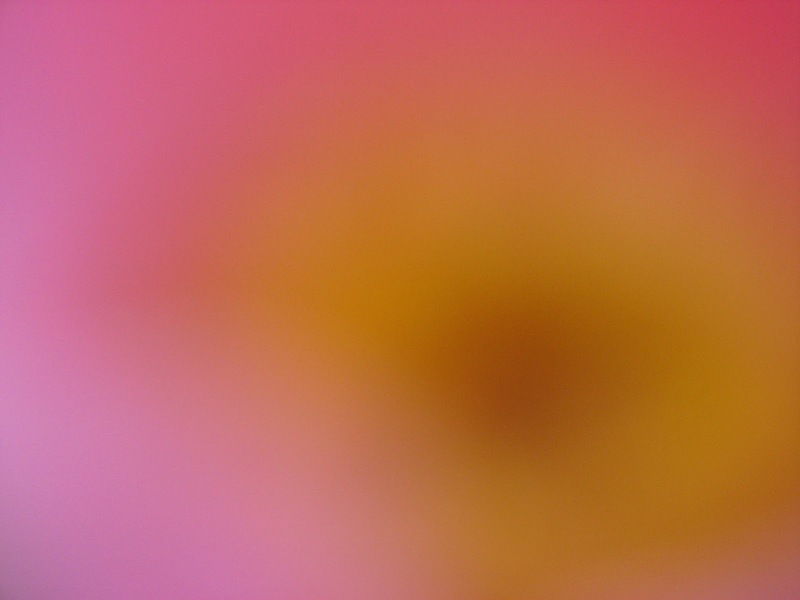 Also, he does not include a description of what happens over the years as you nervous system adjusts to the new energies and you enter a very different state of consciousness as you experience more at a very subtle level, until you find yourself feeling other people's energies or caressing your own aura in delight. "Opening to the Power of Awe"
What if the key to life’s greatest challenges was to approach them like a child... with curiosity, enthusiasm, inquisitiveness... and WONDER? On Wednesday, November 14, my dear friend Andrew Harvey will show you how to access the healing medicine of awe so that you can embrace openness, flexibility, and resiliency (especially in the face of adversity). P.S. During Opening to the Power of Awe, Andrew will illuminate the healing power of awe as an essential practice that’s medicine for your spiritual path. Not receiving this newsletter, but want to? Mirabai Starr writes creative non-fiction and contemporary translations of sacred literature. She taught Philosophy and World Religions at the University of New Mexico-Taos for 20 years and now teaches and speaks internationally on contemplative practice and inter-spiritual dialog. A certified bereavement counselor, Mirabai helps mourners harness the transformational power of loss. She has received critical acclaim for her revolutionary new translations of the mystics, John of the Cross, Teresa of Avila and Julian of Norwich. She is the award-winning author of Mother of God Similar to Fire, a collaboration with iconographer, William Hart McNichols, GOD OF LOVE: A Guide to the Heart of Judaism, Christianity and Islam and CARAVAN OF NO DESPAIR: A Memoir of Loss and Transformation. Her latest book, WILD MERCY: Living the Fierce & Tender Wisdom of the Women Mystics, is forthcoming Spring 2019. She lives with her extended family in the mountains of northern New Mexico. to heal our needy time. We all have our unique journey and gifts to share in this amazing process of planetary transformation. This makes the journey very exciting as we meet and gather together to share our special gifts to create a beautiful tapestry that is the new world that is coming. However, there is one gift that all of us have in common. That is that we are meant to bring light and love into the planet and ground it into the earth while sharing it powerfully with all living beings. While holding I think of the heart as a transformer, taking the light and turning it into love (although they are already one and the same) and then amplifying it so it's more powerful than when it came in. I see us all as being amplifiers of God’s love, transforming it in our own unique way so it's shared in the most effective way with everyone we encounter. I hope this process will help you see yourself as an amplifier of love and encourage you to share it more and more in your own unique way. Speaking for myself, after five visits to this miraculous place, I have been graced with a whole new level of understanding about the sacredness of these amazing creatures, the interconnection of all worlds and the depths of the African Shamanic Tradition. Linda Tucker's teachings are quite amazing, as she entrusts us with some extremely powerful, secret practices from the lineage of lion shamanism that she belongs to, as a pupil of the great South African shamans, Maria Khosa and Credo Mutwa. Linda and I are able to work effortlessly together, in order to inspire the initiates to rise to a completely new level of awareness. I wish I had the words to describe the full radiance of what unfolds in Timbavati, but I would have to be Shakespeare and Rumi combined to do so. What I can say is that in all my 63 years of experience, there is no other place on earth where you can experience the majestic sacredness of creation more purely and more intensely. The white lions are not simply the most beautiful creatures on earth, but are also, as Linda Tucker makes clear in her book, The Mystery of the White Lions, "carriers and transmitters of a revelation crucial to the survival of humanity and nature". Given the enormous urgency of the world crisis, I feel it is essential that as many people as possible receive the grace that pours from sacred Africa and its animal avatars. We only take a very small group, so that the experience can be as intimate and protected as possible. Coming into deep contact with the white lions and supporting Linda Tuckerâ€™s heroic enterprise is I believe, the perfect way to begin your journey into a much richer relationship with nature and into becoming an advocate and Sacred Activist on her behalf and with her blessing. We would love for you to join us. Copyright Â© 2018 Institute for Sacred Activism, All rights reserved. and are swallowed into infinity again. and forgetting when she arrives. for she will wear your face. Last night I attended a delightful performance of African and Middle Eastern music. It included dancing, for folks from the audience got up and danced the hora and than did freeform dancing. I love to watch people who love to dance. They literally go into an altered state, for they know that they are in touch with something special, something that connects them to what is beyond their ordinary selves. I did not attempt to get onto the dance floor, but rather stood by my chair and moved my hands and arms to the music. Later, some told me they were happy to see someone my age moving to the rhythm of the music. What they did not realize was this: once your Kundalini energies are awakened, you can experience sweet bliss with minimal bodily movement. You do not have to swivel and turn, gyrate and jump, in order to feel soft and subtle, yet vibrant and indeed often rapturous energies within. Sometimes even a gentle movement of the fingers is enough to send these delightful sensations flowing through your body. At times even moving your eyes back and forth is enough to awaken these feelings. 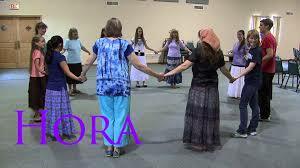 So, although the others may have noticed a nice older lady still able to move her body a bit, I was performing a secret dance within, as the subtle energies were awakened inside. available on Amazon and FB. I have been blessed with an amazing publisher (Emergent Education Press), that is dedicated to publishing books that will help to shape our future. "The Kundalini Poems" is such a book. In my view, Kundalini is the key to our future as a people and a spiritual force. These poems flow from this perspective and were in fact more "received" than crafted. I became the amanuensis, the vehicle for many sacred and mystical verses, that came quickly over a period of some eighteen months. I have worked with a dream editor (Amy Edelstein) who has overseen the publishing process with expertise and devotion. I will publicize the actual publication date when that occurs. In the meantime, I feel much gratitude to see this major project approach completion. Gregg Braden, Dr. Joe Dispenza & Bruce Lipton on Youtube. Youtube enables us to "attend" workshops and conferences without leaving home and generally at no cost. For me, almost anything by the above trio or Lynne McTaggart is worth listening to. They are at the forefront of change, demonstrating in their own lives what the "New Human" might be. However, I do have one reservation. In the midst of all their discussions about mind expansion, they do not specifically mention the spiritual aspect, especially as this is accessed through the mind/body connection. Transformation does not occur in a vacuum. It involves the complete restructuring of the nervous system and the tapping into hitherto unknown feelings and experiences. These, in the right circumstances, connects us to the field of love that is the essence that connects everything in the universe to everything else that exists. 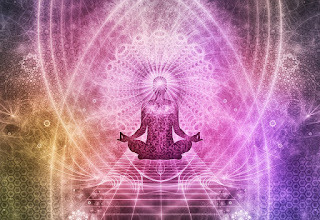 For me and a growing body of others, the key to such connection is Kundalini, the life force itself, that can unleash feelings of bliss and sometimes even ecstasy and rapture when the subtle energies stream through the body. Gregg talks about the DNA of the human being that suddenly appeared 200,000 years ago with no preceding evolutionary history. We still carry this same DNA in our bodies. This DNA, I feel, prepares us to awaken the deep forces of Love as felt bodily bliss and bring what has been unconscious into the conscious mind. This awakening tells us who we truly are and when we experience it we know we are home. For me, such states carry me into a sense of connection with the divine itself. I cannot think my way to "God" nor can I comprehend the full truth of our cosmos, but I can feel that which carries me to a new level of experience and thus I become the "New Human" appearing among us today. I found this conversation one of the most fascinating I could imagine. Greg Braden revealed that recent DNA research has found that humans did not descend from primates, as Darwinian evolutionary theory posits. Rather we emerged without any previous ancestry on earth about 200,000 years ago. We still carry this DNA in our systems. Of course the 'old guard" whose careers and fortunes are wedded to the Darwinian model will oppose this idea, but facts are facts and they will have to revise their thinking at some point. Lynne McTaggart's experiences with focused intention by groups are well known. Her projects with large groups sending intentions have produced verifiable results such as marked reduction of violence in certain key areas. Her more recent experiments with small groups such as the "power of eight' have also produced some striking results, such as amazing healing both physical and emotional. Sometimes it is he healers themselves who are healed in astonishing ways. I cannot recommend this Facebook free event more strongly. Lynne McTaggart and Gregg Braden are two leading pioneers of the New Science, and yesterday they came together in conversation for a FREE Facebook Live event discussing our latent human capacity to heal. Please feel free to share this video to your friends and family and don't forget to leave a comment. We had some lovely comments from people across the globe. Our specific target will be an area within the Gulf States that is especially beleaguered and suffering great conflict and casualties. Cameras and monitors to be placed in a number of hotel conference rooms in both American locations and Arab cities throughout the Gulf States. Both Americans and Arabs who will be joining hearts with my international Western audience, who will viewing the experiment simultaneously via my Youtube channel. Joining in the Intention Experiments is always free. All you need to do to participate is to sign up and we’ll send you the right links before the event.